Our Business Analysis training course is the successful starting point for hundreds of Business Analysts each year. Business analysis is the specialist discipline that helps organisations to make good investment decisions concerning potential business changes. Organisations are constantly striving to become more efficient and effective, and business analysts support these efforts by clarifying the viable options open to the organisation, evaluating these options and ensuring that the selected solution is defined clearly. Investigating business situations - applying a range of techniques to uncover the root causes of problems and identify key issues. Analysing business needs - understanding the business stakeholders and their views, building a common vision of the desired business system and identifying the required actions for change. Evaluating options - identifying the options for business change and working with other professionals to define the financial and business impacts for each option. Defining requirements - modelling and documenting the business and system requirements. Managing benefits - supporting the project sponsor and project manager in ensuring that any changes to the requirements are reflected in the business case. Effective business analysis requires both professional skills of investigation, analysis and modelling, and interpersonal skills for working with a range of people. This course will take you through a proven, structured process to improve your ability to collect, analyse and forecast business and financial data in order to generate valuable insights from business data. This course will also teach you how to report on business data and present information and analysis to clients and stakeholders. It is aimed particularly, but not exclusively, at financial and business analysts, managers, planners, customer-service staff, operations staff and information-management personnel. The Business Analysis course is suitable for anyone who requires an understanding of Business Analysis. This includes business analysts, business managers and their staff, business change managers and project managers. This course is also suitable for those who are considering a career change to become a business analyst and who would like to understand more about the role. This course is also suitable for those who are considering a career change to become a Business Analyst and who would like to understand and learn more about the role. There is no experience or previous qualifications required for enrolment on this course. It is available to all students, of all academic backgrounds. Having basic knowledge and understanding of business and finance will be advantage for this course. Successful candidates will be awarded certificate for “Business Analysis Essential Training”. This online training course is comprehensive and is designed to cover the following key topics are listed under the following curriculum. This course has been designed for 30 guided learning hours. 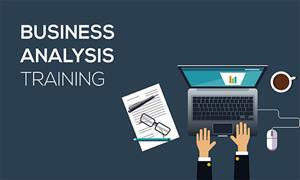 Fill out your details to find out more about Business Analysis Training - Online.